Dorade is a small while fish of Mediterranean origin. It's one of my favorite fish. One of the ways I enjoy preparing it is simple. Cut slits on each side of the whole cleaned fish. Season with salt and pepper. Combine the ginger, onion and tomato with salt and pepper to season. Stuff the belly and head of the fish with mixture. Skewer the fish to close. Pour olive oil and coat both sides of fish. 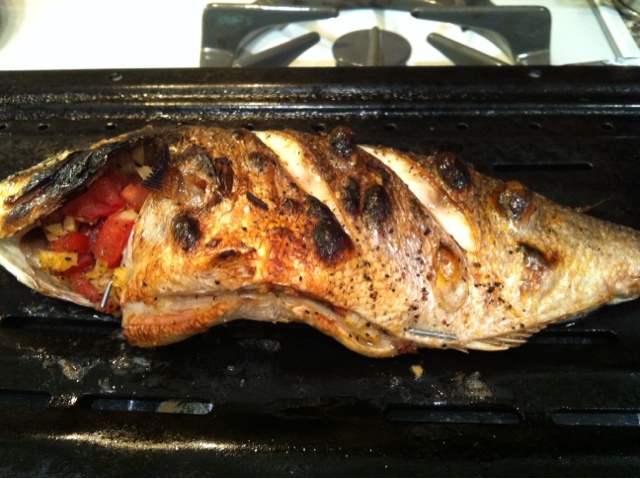 Broil fish 5 minutes on one side and 3 minutes in the other side. Remove and let it sit in pan for about 3 minutes. Serve with a nice healthy salad and sliced lemon. I like eating it with a fish sauce-lemon mixture with sliced Thai mini hot peppers. You can also use branzino, pompano, or milk fish.